Mike McCuistion was born in 1937 in Lincoln, Nebraska. 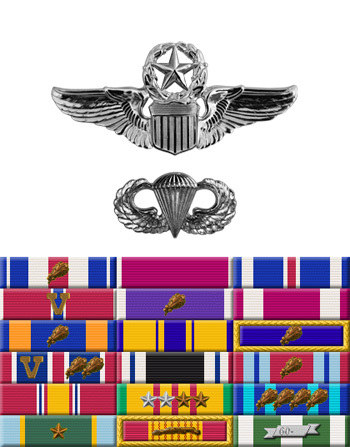 He was commissioned a 2d Lt through the Air Force ROTC program on June 4, 1960, and went on active duty beginning March 9, 1961. Lt McCuistion completed Undergraduate Pilot Training and was awarded his pilot wings at Craig AFB, Alabama, in March 1962, and then completed pilot instructor training before serving as a flight instructor with the 3646th Pilot Training Squadron at Laughlin AFB, Texas, from June 1962 to September 1966. Capt McCuistion then completed F-105 Thunderchief Combat Crew Training before deploying to Southeast Asia, where he served as an F-105 pilot with the 333rd Tactical Fighter Squadron at Takhli Royal Thai AFB, Thailand, from April 1967 until he was forced to eject over North Vietnam and was taken as a Prisoner of War on May 8, 1967. After spending 2,128 days in captivity, he was released during Operation Homecoming on March 4, 1973. He was briefly hospitalized to recover from his injuries, and then served as an A-7 Corsair II pilot and Operations Officer with the 355th Tactical Fighter Squadron of the 354th Tactical Fighter Wing at Myrtle Beach AFB, South Carolina, from December 1973 to 1976. 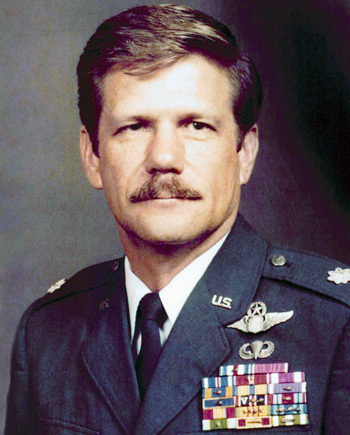 Col McCuistion then served at the U.S. Air Force Tactical Fighter Weapons Center at Nellis AFB, Nevada, where he served as lead officer conducting the follow-on test and evaluation for the A-10 Thunderbolt II from 1976 to 1979, followed by service as Air Force Advisor to the 466th Tactical Fighter Squadron of the Air Force Reserve, flying the F-105 at Hill AFB, Utah, from 1979 until his retirement from the Air Force on April 1, 1981. After retiring from the Air Force, Mike worked as a corporate pilot from 1981 until retiring in 2002. Captain Michael K. McCuistion distinguished himself by gallantry in connection with military operations against an opposing armed force as an F-105 pilot over North Vietnam on 30 April 1967. On that date, Captain McCuistion played a key role in an extremely complex and hazardous search and rescue mission which involved four downed crew members. Captain McCuistion selflessly placed his personal safety in jeopardy by pushing his fuel state to hairline limits in an attempt to insure the rescue of his downed comrades. The high degree of professionalism, courage under fire and extraordinary airmanship displayed by Captain McCuistion could have made these rescue attempts successful had not other factors deterred the rescue helicopters. By his gallantry and devotion to duty, Captain McCuistion has reflected great credit upon himself and the United States Air Force.